Usage notes: In French, honni soit qui mal y pense tends to be used ironically, to hint at hidden bad intentions. Charles-Henri ne fait aucun bruit depuis des heures – honni soit qui mal y pense. Charles-Henri hasn’t made a sound in hours – he must be up to something. 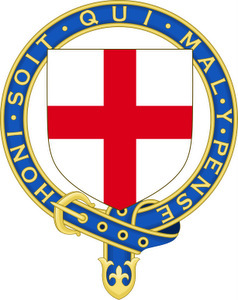 Honi soit qui mal y pense is found on many anglophone countries’ military badges, and is also part of the UK’s Royal coat of arms, which means it appears on British passports. The historically correct spelling – and therefore what is found on badges, crests, etc. – is honi, which is the Old French conjugation of honnir (to shame, to be contemptuous of). However, the modern spelling is honni, so that is what French speakers will tend to write. Incidentally, there is a fascinating book about the back-and-forth relationship between French and English, called Honni soit qui mal y pense, by Henriette Walter.